Whenever somebody suggests dining out (or even, getting a take-away), you can guarantee that I'll chime in and place my vote on Wagamama. If you follow me on Instagram and regularly watch my stories, you'll already have a sound grasp of how much of my time and money is spent on a good ol' Waga. For me, it's the restaurant for everyone - my mum and I visit regularly to grab lunch in the city centre when we're catching up, my boyfriend and I love a date night here, and, an actual quote from my best friend calls it "the best post-sesh dinner, possibly ever" which essentially translates to "a great restaurant for social occasions". Wagamama serves up a spectrum of Asian food and drink inspired by fast-paced Japanese ramen bars. Their aim is to bring the fresh, nourishing flavours of Asia to the table. For 25 years, they have been refining and developing each dish to perfection - their philosophy revolves around the concept of Kaizen; the art of good change. Adapting each recipe to form a harmonious and synchronised menu that indulges in the Japanese/Asia culture so authentically. What's more, Wagamama caters for all dietary and lifestyle preferences. They have a concise, clear allergen chart which shows you which dishes are gluten free, seafood free, dairy free etc. It also highlights which dishes containing allergenic ingredients can be modified to suit your diet. 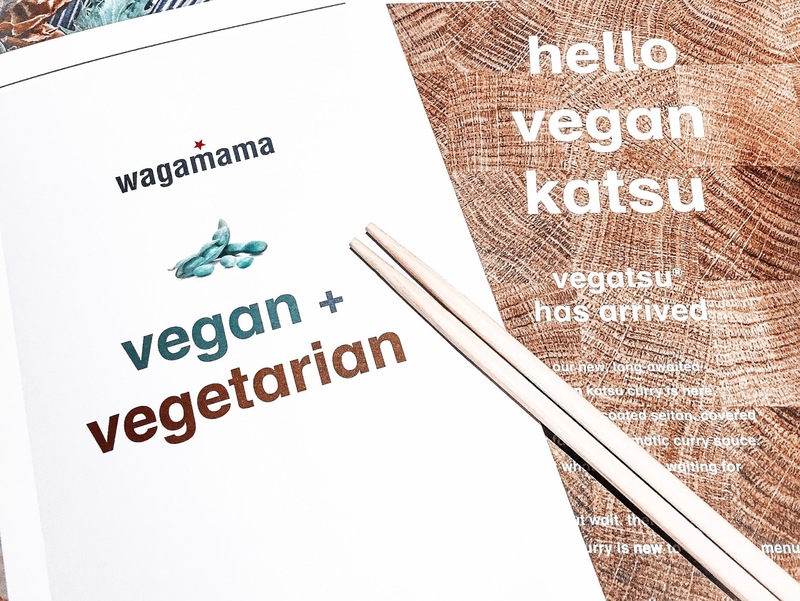 Wagamama also provides an extensive vegetarian and vegan menu; it's certainly the most varied vg/v menu I've come across! Their website states that they "try to be as flexible as possible" regarding dietary requirements. More info on allergen information here. Prior to my visit, I was unaware of Wagamama's pledge to sustainability and the environment. Not only do they provide a vg/v menu, but they work tirelessly to ensure that all of their restaurants are eco-friendly. Incorporating their Kaizan philosophy into every aspect of their restaurants; they have banned plastic straws and exclusively use paper straws as requested. They have energy-efficient lighting to create ambiance that doesn't use up a tonne of electricity. Wagamama have also installed intuitive water-regulating technology which has saved over 28 million litres of water to date. Can't finish your generous portion size? Wagamama turn all waste products into powder, which then gets carted away and used in an anaerobic digester, which converts the powder into sustainable energy. Veganism and Vegetarianism is on the rise; rightly so! It's refreshing to see a chain restaurant speak to and cater for the minority - putting it's customer values before profitability, to ensure that everyone can experience a taste of Wagamama. They even "think [their] plant-based menu might even inspire a few non-vegans to hop from time to time!" Jerome and I were kindly invited to the Meadowhall restaurant to taste the vg/v menu. We opted to try out vegan starters and mains and then indulge in a veggie dessert (the drinks were also vegan). More info on the vg/v menu here. Starters/sides: Upon recommendation by the staff, we ordered a portion of Bang Bang Cauliflower. Now, I love veg, but I am not keen on cauliflower, mainly because I find it bland, dry, and named it "the boring broccoli". I swiftly changed my mind once I tried this side dish - it was spicy, full of flavour and juicy. I am now a cauliflower convert, but only if it's cooked Bang Bang style! We also ordered a side of Wok Fried Greens; the pak choi and tenderstem broccoli are a Wagamama staple for me. I order them with e v e r y meal; they're bursting with colour, flavour and they are so aromatic! The main flavour is garlic; they're essentially swimming in the stuff. Jerome hadn't tried the Wok Fried Greens until last night and was very, very pleased that he'd discovered them. The portion sizes were generous. Mains: Jerome opted for the dish I usually have: Yasai Pad Thai with Tofu. His consensus was thoroughly positive, however, he'd have it without the tofu due to personal palette preference. The dish was well-flavoured and again, the portion size was generous. I chose the Vegatsu which is the vegan version of the famous Katsu Curry. It contains Seitan in a crispy breadcrumb coating with the Katsu curry sauce and sticky rice. I ordered this dish not knowing what Seitan was; Jerome Googled it - it's essentially just wheat gluten and is used in a lot of meat-alternatives as a "base". It was incredible! The textures and flavours came together perfectly. The portion size was very generous - I would definitely order it again, but ask for a reduced amount of rice. Desserts: We both chose the Chocolate Layer Cake, SHOCKER. I messaged Wagamama on Instagram to inform them that this was the best dessert I had ever tasted, they concurred. It was rich, full of creamy textures and the vanilla ice cream really complimented the cake. Again, the portion size was generous. I'd just like to add that the service was lovely - we observed how the staff interacted with paying customers and there was no difference in the quality of service. Usually, I find that staff give me "special treatment" because I'm writing a review on their place of work, however, I cannot fault the staff based on this experience. The staff were professional, friendly, funny, and accommodating. I appreciated their recommendations on food and drinks. A big thank you to Rachel and the team at Wagamama Meadowhall for inviting us to taste the vg/v menu. I've already planned to visit again next week with my girl friends!